4Rivers Smokehouse is a brand new restaurant that opened last week in Winter Garden FL that we had heard rave reviews about. This is a 2-chain restaurant owned by a Floridian turned Texan, John Rivers, he stepped out of 20 years in corporate America to pursue his dream of opening a traditional Texas smokehouse in Florida as a platform to introduce his 18-hour, slow-smoked Angus brisket in what was otherwise considered a pork dominated market. When pulling up to the restaurant the first thing we noticed was that the line literally was wrapped around the outside of the building. One the causes of this long line is that they have cafeteria style ordering where you order each item as you go down the line. Well, even though the line was long, it didn’t take more than 20 to 25 minutes until we were seated and ready to chow down! 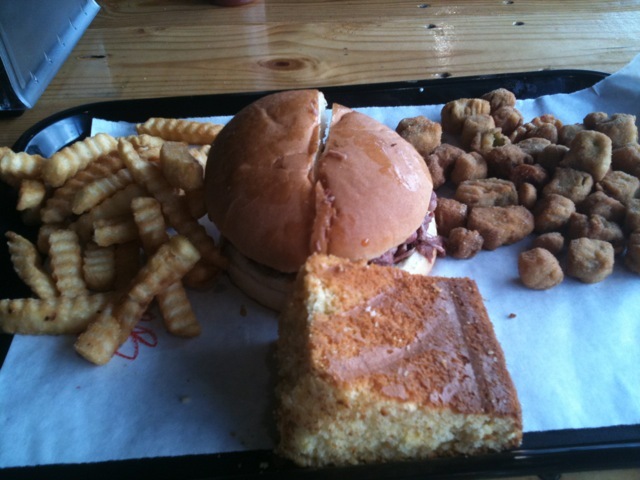 I ordered the brisket sandwich with fried okra and french fries and cornbread. I had a hard time deciding which sides to get as everything looked delicious. My husband got fried pickles and macaroni and cheese which I also sampled. This is a restaurant that I would definitely come to again. The brisket was amazing and all the sides were tasty. The restaurant had a good feel to it with its selection of nostalgic sodas and it’s copper sinks to wash your grubby hands in after pigging out (pun intended)! You’ll certainly leave with a major sugar high from their awesome dessert counter. 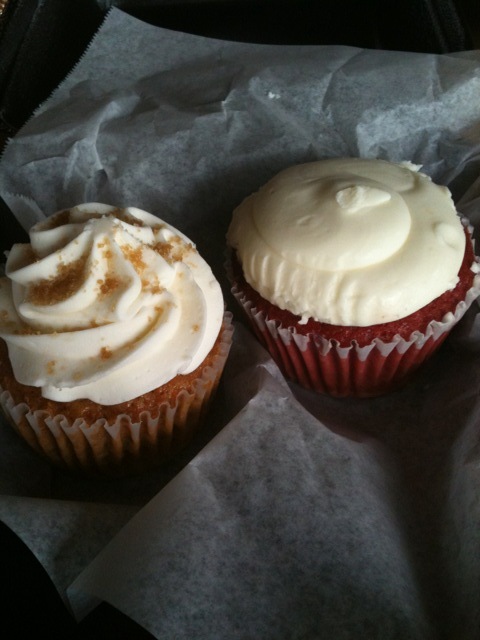 We got a red velvet cup cake and a carrot cake cupcake. The red velvet was groovy while the carrot cake was something that I wouldn’t walk a mile for, but still good. Overall this restaurants friendly staff mixed with good BBQ is a place that you can probably count on to be consistently good and reasonably priced! Secret tip: if your short on time, call in your order on the way over and then pick it up at the to go window and have a seat at any of the picnic tables to enjoy there.